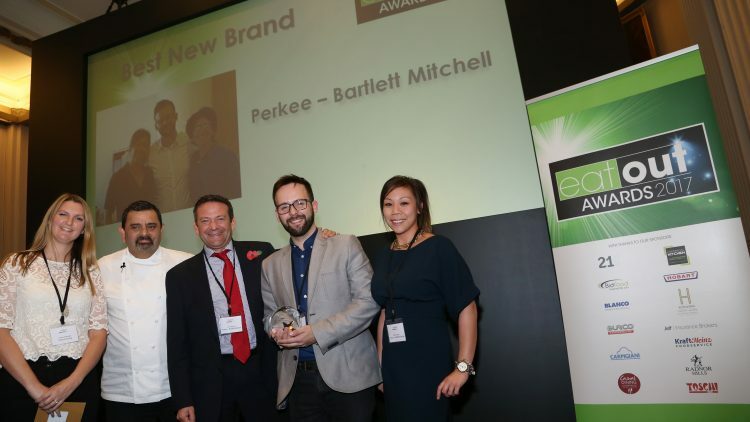 bartlett mitchell’s sustainable coffee brand Perkee took home the award for Best New Brand at the 2017 Eat Out Awards last week. Perkee, which recently celebrated the sale of its 500,000th cup, was recognised among some of the biggest names in the casual dining sector, including Carluccio’s, Yo! Sushi, Prezzo and Wagamama. The company was the only caterer to pick up an award at the prestigious ceremony. CEO Ian Thomas was joined by coffee brands manager Miguel Teixeira Camara and senior marketing designer Emma Sison to collect the award, which is was presented by top chef Cyrus Todiwala. Perkee has beaten most major global coffee brands in blind taste testing and was named runner up at the Support Global Farmers category at the Food Made Good Awards 2017 – the Sustainable Restaurant Association’s annual awards. At the same time, sales of Perkee at 50 bartlett mitchell sites have helped develop sustainable community projects and the creation of job opportunities for people who need them most. Perkee is produced in partnership with Bewleys and Nicaraguan coffee co-operative Soppexcca, which puts its profits back into local education, diversification and health centres. Eat Out magazine hosted the 2017 Eat Out awards at the Freemason’ Hall, London, where more than 200 guests came together to celebrate the hospitality industry. Ian Thomas, bartlett mitchell, CEO, said: “We are absolutely delighted to win this award. “Perkee puts sustainability at the forefront of its proposition and reinforces the fact that consumers want to buy products with a social purpose.